Lucy is my best muse. Tiny helps with pompom making. Testing out the softer netting. As the BIG Anxiety festival draws ever nearer, I am plunged into a flurry of making, musing, more making and more musing. While crafting the installations for Clement Space in the City, contemplating the concept itself, and trying to find spaces of clemency along the way, an old song of mine wove its way into my consciousness. Food. Nourishment. Sensory engagement. Pleasurable. Challenging. Textures so beautifully sublime. Textures so horribly excruciating. Synaesthesia. Association. Memory. History. Imagination. Creativity. Every morsel contains a story. A luxurious narrative. A simple note. Tendrils spreading and intertwining inexorably. The good, bad, and the downright ugly. Not forgetting wonderment and gratitude, so often delicately woven into comestibles too ordinary to warrant reviews. Yet, for many with sensory atypicality, the aversions are real, as are the struggles. And for others, there is just no food. Or not enough. I am grateful that I eat. I am also mindful of my own sensory attractions and aversions. My interest in food in its complete resplendent glory emerges from this multi sensory, multidimensional engagement. Go ahead and photograph your food. Capture in the visual as much of the sensorial richness as you possibly can. Make no apologies for food obsession. I don’t. Dogly. Full of dogliness. Thinking of my friend Rick, as I tuck in. Thanks for the noshful souvenirs! Mumma, I wanna go there, not there! After yesterday’s sensory agitation, Lucy crashed into bed and slept through the night, till our usual 5.30am. My recovery was less exuberant. I woke up in considerable pain – what is wrong with those shoulders and elbows? – but Lucy always ushers in the day with so much dignity and judicious consideration that I cannot stay in bed rotting inside my mental swirls. We cuddle, then she tells me it is time for our early morning walk by bouncing out of bed, standing parallel to the side, and waiting for me to place my hand on her shoulder for balance as I slowly creak out of bed. Yes, creak, a sonic production as much as it is visually pathetic. Nobody sees this but Lucy, no ma’am! This video is a repost. I love Pina Bausch. This woman knew about passion in a very cogent, stark and confronting way. Her work lives on forever and grows more and more powerful in the inspiration of those who embrace, resonate with and admire her work. As a musician, I have always been fascinated by Igor Stravinsky. Le Sacre du Printemps remains one of my favourite works. Stravinsky’s music has very concrete links to the visual and tactile senses, to me, they are not meant merely for ‘listening’ to alone. That said, even though I am not a true synaesthete, I am nevertheless unable to engage merely one sense in conscious isolation, in any case. Pina Bausch’s interpretation of this work is the best I have ever seen. Her work is full of tactile associations, with sometimes overwhelming emotional, psychological and philosophical threads interwoven into a massive confronting tapestry yet so delicately intricate and detailed at the same time. Both Stravinksy and Bausch are “in-your-face” geniuses. Their work speak things that makes some people uncomfortable, and yet brings immense exhilaration to others. These are no bland, neutral background New Age sonic sensorial stirring in the cosmic atmosphere. These are challenges to spirit, soul, body (senses) and intellect. OK, look at this face. Look at how beautiful this creature is. I am not the only one to say so, 90% of the neighbourhood agree with me. So, tell me, how could anyone be nasty to her? Apparently, some, of course. The remaining 10%. This morning, I received a piece of good news. I feel a great sense of relief, that one issue on the list of things to be resolved is now dealt with. A positive outcome is always welcome too! So, for lunch, I am indulging in a huge helping of spaghetti and minced beef on a bed of lettuce leaves. The last minced beef patty was used for the tomato based sauce, and the last few leaves of lettuce formed the base. Dressing is the same old mustard, flaxseed oil and soy sauce mixture – us Aspies seldom deviate too far from our routines and habits. Light green. That is the general colour of this meal. And the colour of relief, to me. 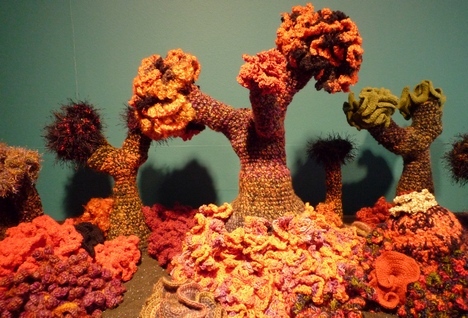 Anyhow, check this out, even if you are not a crochet freak and you don’t like the haptic sensational of twisting, turning and winding yarn, the visuals are great! 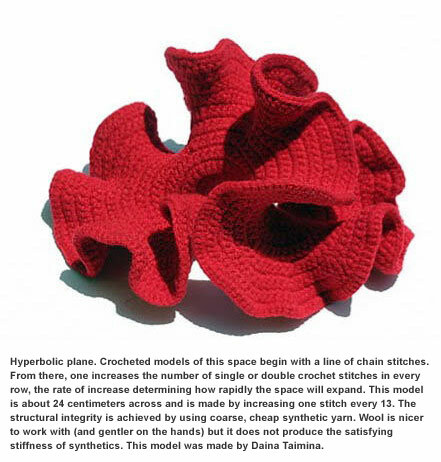 And my all time inspiration, the wonderful crochet project kicked off by mathematician Margaret Wertheim and her artist sister: Hyperbolic Crochet. Such a wonderful collaboration of art and science, haptic and intellectual, and making it all accessible to anyone who wants to get involved. Beautiful! And here are two photos to whet your appetite. Observing my Lucy and her responses sometimes reminds me of my own hypersensitivities. I am sure many autistic individuals identify better with animals in many ways than with neurotypical humans. Temple Grandin’s now famous book tells us that “Animals Make Us Human” – if by being ‘human’ in this context means more insightful, kinder, more caring, and more aware of the state of ‘being’, of pneuma, then yes. Lucy has made me a better human being. 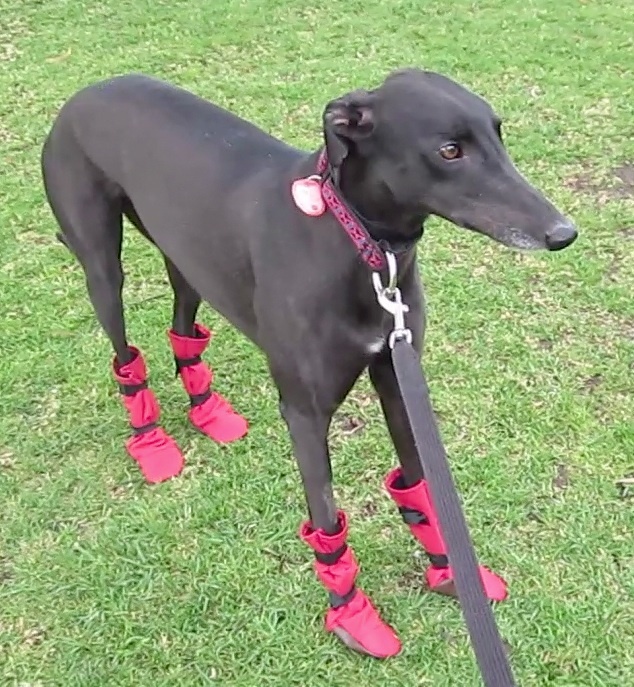 I ordered a set of lovely red boots specially made for Greyhounds, all the way from Canada. 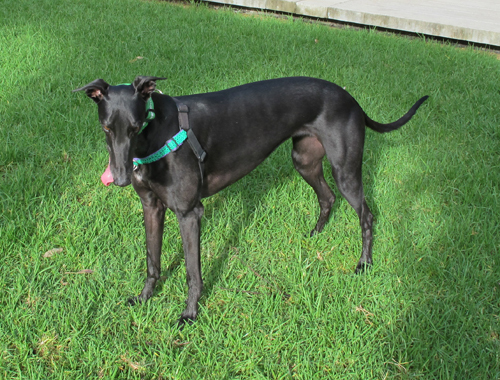 This online shop had all sorts of things for Greyhounds. This was after Lucy’s accident, and I ordered them to protect her wounds from the elements when we were out walking. Unfortunately, they took too long to arrive and she had already healed by then. Anyhow, it was raining the other day, and so I decided to try them out on her. She hated them. For some reason, no matter how tightly I wound the velcro around her ankles, they kept sliding off. What was worse, she decided to try to take off the front boots by nibbling at the velcro. Funny thing was, she was ok with the once on the hind paws. They’re a darling looking set of boots, but I don’t blame her for disliking them, they didn’t fit well. A pity. This whole experience reminded me of my own search for comfortable shoes. I once had 200 pairs. All very expensive. Salvatore Ferragamo was my favourite because their shoes were most comfortable. Still my favourite, even though I can no longer afford their shoes on my meagre scholarship stipend. Anyhow, regardless of the number of shoes I once owned or now own, I still have the habit of only wearing about 4 pairs. The rest are sort of like eye candy, or a sense of ownership. I guess the preference for only a few very pairs, worn repeatedly, is more in sympathy with Lucy’s focus on sensory comfort and nothing else. These ones are my sneakers. A pair of dark green soft patent leather Ferragamo, black suede and patent Geox, moss green suede Bally, sable calf leather Ferragamo, white calf leather Acupuncture, cheap black boots bought in an alley in Hong Kong, and wine red Doc Martens lace-up boots. I have not worn any of my other 30 pairs (all that is left of my old collection from my former glory days of fashion) in a year now. Having far too many than I need is a human thing, not a doggy thing. At the end of the day, Lucy knows better. What’s comfortable. What’s better for our senses, will ultimately be better for our mental functioning and emotional wellbeing. So here they are. Lucy’s shoes. And my shoes.